In 1996 I saw a commercial display table that had many rods supporting a glass top. 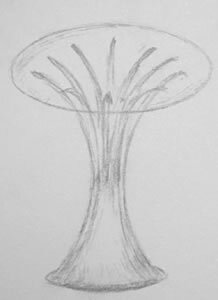 I took note of this concept and in 2003 I decided to use this idea for a concrete and glass table. I wanted to completely document the construction for presentations. Many different techniques are illustrated; covering the armature with hardware cloth and chicken wire, hand-building with mortar and the use of a pallet knife to sculpt anchor cement. The name of the table is invested with layers of meaning that are derived from the unsettled times in which it was made both politically for the country and me personally.